Time was, you brought the family yacht alongside the dock and shipped the oars or doused the sails. Then people started putting engines in boats, mostly 2- to 3-hp one-lungers that moved you around at rowing speed — without the oars and sore back. Larger engines followed, and eventually they were light enough and powerful enough to get a boat up on plane, at which point hulls began changing shape to accommodate them. But safe docking was still very much a manual affair that required judicious use of the wheel, throttle and gearshift. And when the inevitable mistakes happened, there was plenty of entertainment for slip neighbors. No longer. Technological advances have made maneuvering a boat much easier. Weekend warriors using a joystick control system can feel as confident as old tars when they back into a slip in a cross current. 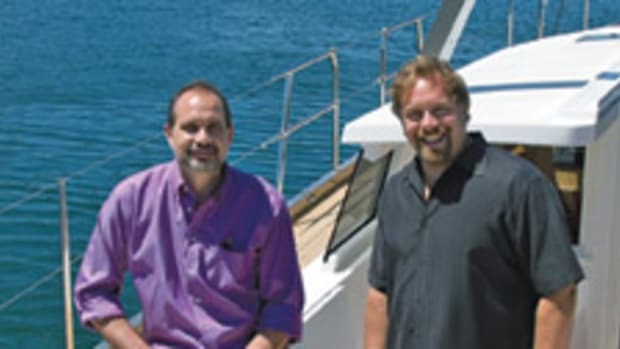 Much to the delight of the people who build and sell boats equipped with these systems, newly confident boat owners are also moving up — sometimes way up — to boats they likely wouldn’t have considered just a few years ago. For example, Tiara Yachts president David Slikkers tells me owners of his 42-footers began jumping up to the Tiara 58 when triple IPS power — Volvo Penta’s pod-drive and joystick Inboard Performance System — was introduced. I love driving boats and ships — it’s the one thing about the Navy I really miss. And the more challenging the situation (I have plenty of boat insurance), the more I like it, thanks in part to an optimistic nature and (probably more so) to a poor memory. So what I do not like about IPS, CMD Zeus, MerCruiser Axius and various other joystick control systems is that they take all the fun out of boat handling. 3-knot current, gusty wind, rocks ahead, a 70-footer on both sides. Since a 14-year-old can now dock a 58-footer after 20 minutes of instruction, handling in tight quarters has become about as challenging as playing my Atari 2600 video game console. But it seems I am in the minority, considering how many IPS boats are out there and how other joystick systems are starting to sell as well as anything is these days. 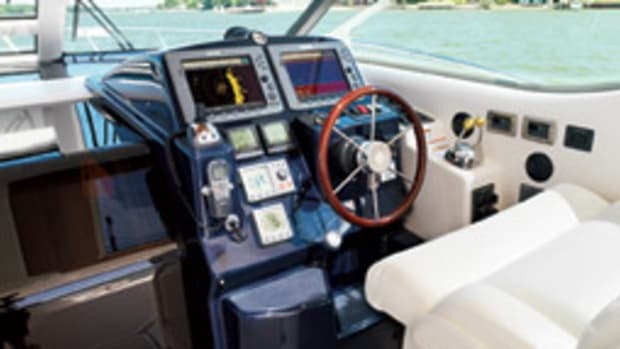 The idea behind the joystick is to take the separate controls for steering, throttles, engine transmissions and bow thrusters offline in favor of a single stick that can make the boat go in any direction. It’s called a joystick because whither the stick goes, so goes the boat, thereby bringing joy to the unstressed operator. Now that we’ve discussed a little of the psychology of boat handling, let’s look at the physics. It may help to understand there are two basic classes of systems. The first type of system individually azimuths (turns) lower units. 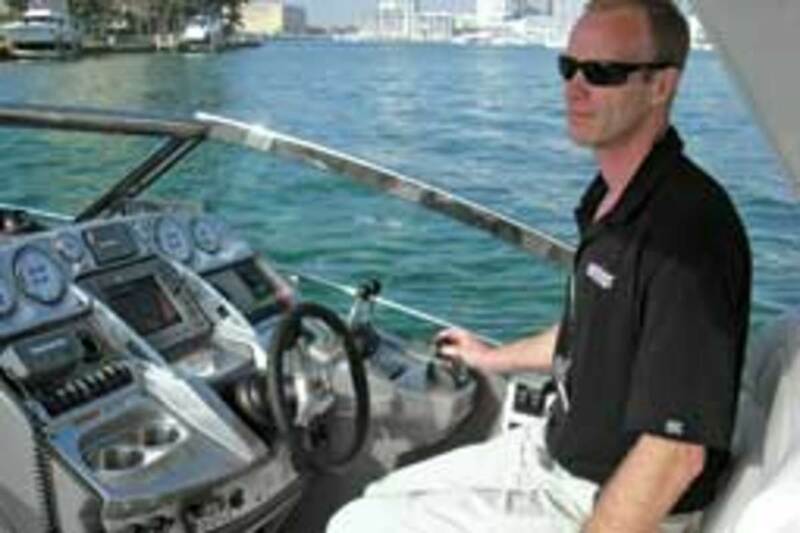 These include the IPS, Cummins MerCruiser Diesel Zeus and ZF pod-drive systems, and Volvo Penta Aquamatic DPH or DPS and MerCruiser Axius sterndrives. The key is that the drives are connected electronically, not mechanically, and can turn independently using electronic steering. 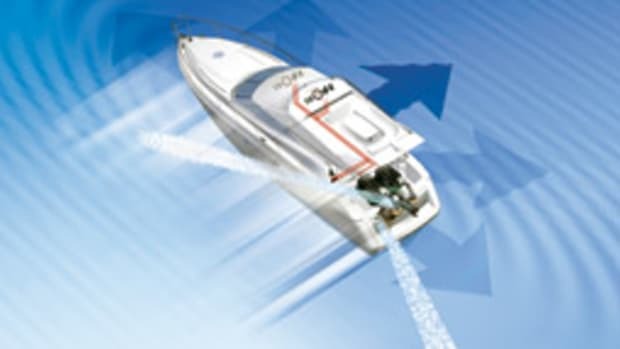 These systems do not require bow or stern thrusters because the drives turn, throttle and shift independently of one another, so they are able to set up the vectors they need to move the boat in any direction — linear and rotational or a combination of the two. Push the stick in one direction and the control system’s computer figures out that it needs to turn the port unit 23 degrees to the right and power astern at 970 rpm while turning the starboard unit to the left 11 degrees and powering ahead at 730 rpm to make a certain maneuver. The same applies if you want to sit there and spin, twist the boat, move it diagonally, or twist and move ahead at the same time. All you do is twist the stick and so goes the boat, as the computer directs the drives’ individual angles and direction and thrust. The farther you push the stick, the more the engines speed up, to a set limit. Nothing (well, almost nothing) you can do to the joystick will confuse the electronic brain. 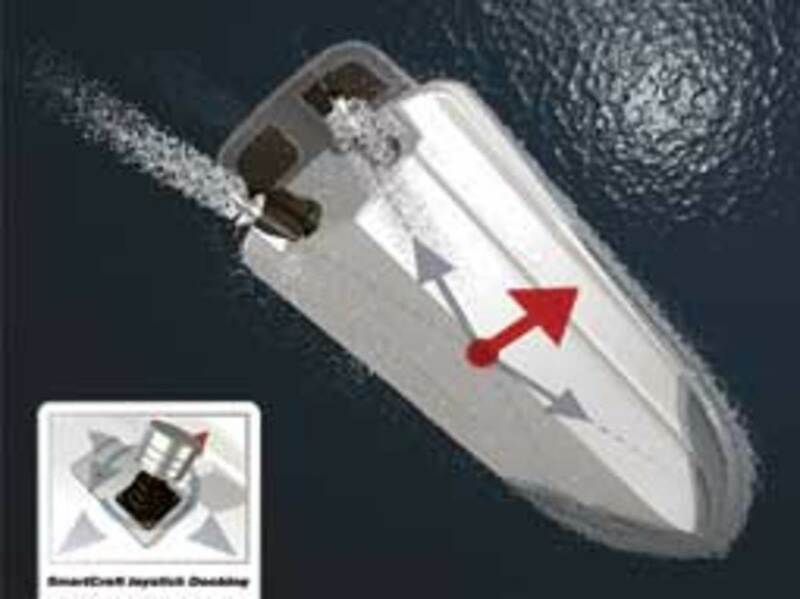 The second type of joystick system involves boats equipped with standard inboard engines with straight propeller shafts. Both systems greatly improve maneuverability, which is achieved in a number of ways that I’ll get into shortly. But let’s start off with a look at various pod drives and sterndrives to see how the joystick-control systems make life on the water a lot easier. 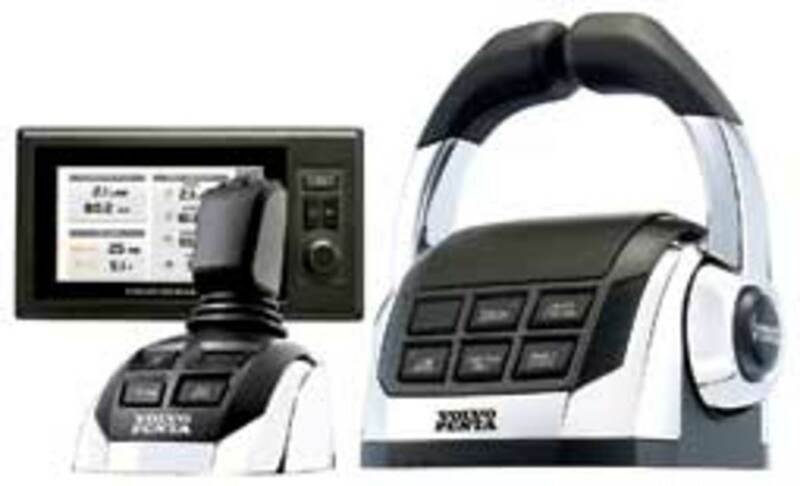 While joystick systems make it easier to maneuver a boat, they are not all created equal. Some are more effective than others, though there are some shared characteristics, too. For example, the individually controlled pods and sterndrives create a lever arm (a force times a distance) in relation to each other — that’s why two of them are needed. The lever arm is essentially a function of the distance of the drives from each other laterally and in relation to the hull’s center of resistance. This, in turn, is a function of how far the pods and sterndrives are positioned forward of the transom. The farther outboard and the farther forward of the transom the pods or drives are, the more effective they will be in changing the position and orientation of the hull. The distance from the transom matters because a lever arm can work against you as well as for you. The transom-mounted sterndrives are farther aft (farther from the pivot point than the pods), so they have to work harder to create the thrust vectors needed to move the hull sideways. They also have to work harder because they are mounted very close together laterally and are way abaft the hull’s center of resistance. Also keep in mind that when you put one sterndrive in forward and the other in reverse (no joystick for a minute! ), the hull’s pivot point is far forward, very near the bow. If you do the same thing with pods, which are farther forward on the underside of the hull, the pivot point is farther aft, so the boat will twist with less effort. That’s why pods are more maneuverable and will carry off the same maneuver with less thrust. Another thing that matters in terms of controllability is the shape of the hull below the waterline. The deeper the hull, the more it will resist lateral movement. Appendages matter, too. For example, when I ran 45-foot Dorals — one with Zeus and one with IPS — a few years ago, the IPS boat went sideways almost twice as fast as the Zeus boat (1.5 knots vs. 0.8 knots). This was a result of the Zeus pods’ turning angles being limited by the hull tunnels (which IPS boats don’t have) and likely by the tunnels themselves, which because of their shape resist transverse motion like a keel would. Obviously, if you add a keel — even a 2-inch-deep blocking keel — it will slow sideways motion a lot because of the added resistance that the keel creates. And the longer the hull is in relation to the distance between the drives, the slower it will respond laterally. Being lighter also helps responsiveness since the deeper chine immersion on a boat with high bottom loading will also add lateral resistance. Pods are more responsive than sterndrives because they develop more lever arm in relation to the hull’s longitudinal center of resistance and because the pivot point moves aft when the pods are twisting the boat. This is not to take away from Axius and Aquamatic sterndrives. They work very well. Just understand the physics involved so your expectations are managed. Expect the same results with joystick systems designed for outboards, as Mercury and Yamaha eventually introduce them into the marketplace, which I hope will be soon. Zeus and IPS also have station-keeping features that use GPS to hold a fixed position and heading. Just push a button and, depending on current and sea state, the boat will stay in position within a yard or two while you’re waiting for a bridge to open, or while you’re getting the dock lines out when heading back to the marina. I am wary of these station-keeping features because as sure as God made little green apples some idiot is going to leave the bridge to use the head or make a sandwich while the props churn away. Or worse, the pilgrim will engage the station-keeping feature while swimmers are in the water. If you have a pod boat with station-keeping, use it with caution, never leave the helm and always be aware of what’s going on abaft the bridge. ZF Marine and Twin Disc saw that their conventional straight-shaft products might go the way of the dodo with the superior economy, compact installation and maneuverability of pods, so they decided to address the aspect most amenable to improvement: maneuverability. Both OEMs have come out with systems that use the engine gears and throttles coupled with thrusters to bring joystick responsiveness to twin inboards. Twin Disc’s is called EJS (Express Joystick System) and it controls the propeller direction and speed (as low as 50 rpm) as well as the bow and stern thrusters. As with any joystick, it reduces the chances of docking mishaps simply because there’s only one control to lose track of. Who hasn’t grabbed the throttle thinking it was a gearshift? And it’s pretty tough to steer and simultaneously control the engines and the bow and stern thrusters unless you were born with three hands. A Twin Disc QuickShift transmission is required, along with the EC300 control system. Also required are hydraulic bow and stern thrusters that can stand up to the heavier and longer-duration use in these applications better than electric thrusters. The transmission is key because its design allows for rapid low-shock shifting, along with the low shaft rpm. You can watch a video of the system on YouTube (search Twin Disc Express Joystick System). Since the system is limited to the props and bow and stern thrusters, it has no more intrinsic maneuverability than a conventionally controlled boat with the same transmissions and thrusters. What makes the system worth its salt is you do not have to be nearly as skilled (and lucky) to get the same result. Again, there’s only one control to keep track of, which takes a big cause of mishaps out of the equation, and the electronics determine how much throttle to use, when to shift, and when and how strongly to apply the thrusters. ZF has a similar joystick system for inboards called JMS (Joystick Maneuvering System). It provides very low shaft rpm for precise control by using trolling valves, and a single joystick controls a bow thruster as well as an optional stern thruster. It has an integrated compass that keeps the boat on a selected heading and an internal GPS for automatic station-keeping. 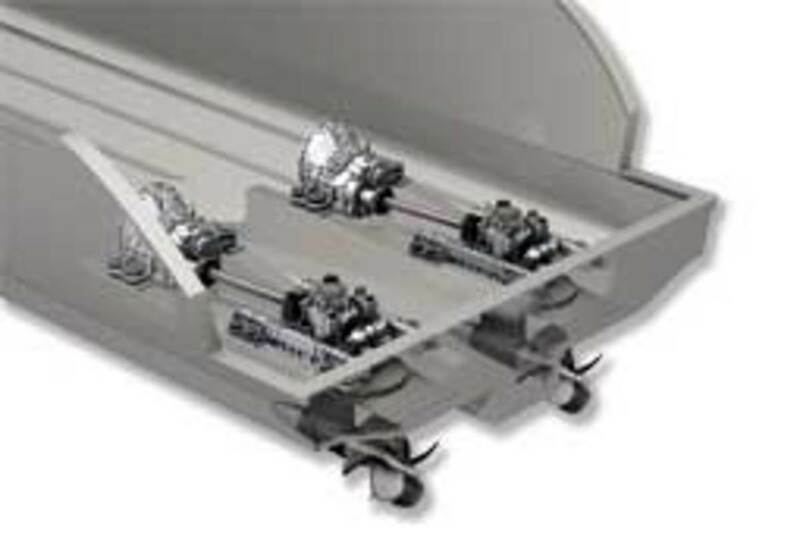 The system can be retrofitted in existing vessels, and up to six stations can be installed. Smooth- and fast-shifting transmissions are a key component of the system. ZF has gone a step further by developing a single-pod and joystick system incorporating a single lower unit that rotates 180 degrees to give near instantaneous port/starboard thrust. The system also incorporates a bow thruster. I ran the SeaVee 34 last fall that has this system and the boat maneuvered well at slow speed. (I did not run it at speed or offshore.) I understand that the system has since been improved by decreasing the lag between command input and response. The ZF and Twin Disc straight-shaft systems can be retrofitted in existing inboard boats, and Twin Disc says its system is more responsive than pod drives, though it makes no claim about matching pod efficiency or compactness. If you want efficiency in a larger boat, go with pods, and now you have the option to stay with conventional inboard drives and still have joystick control. Last, but by no means least, there is the waterjet joystick. 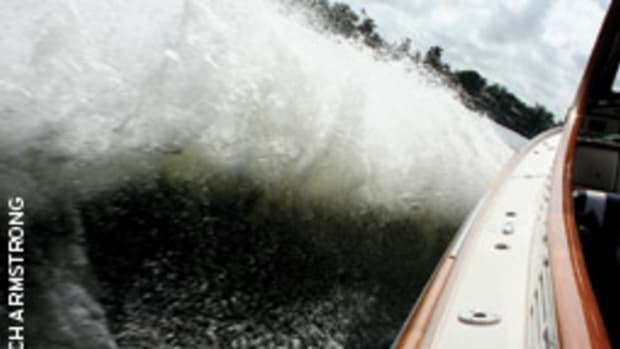 Waterjet propulsion is where joystick control systems all began, and these boats still enjoy a big advantage over other propulsion systems in that power can be almost instantly reversed by dropping the reversing buckets to deflect thrust forward. Jets can’t be beat for shoal-draft capability and swimmer safety. And since there are no appendages to slow things down, spinning speed at the dock using the joystick is faster. One of the difficulties with prejoystick waterjet systems arose when backing down. The boat would head in the opposite direction you’d expect it to go because of the geometry of the reversing buckets. 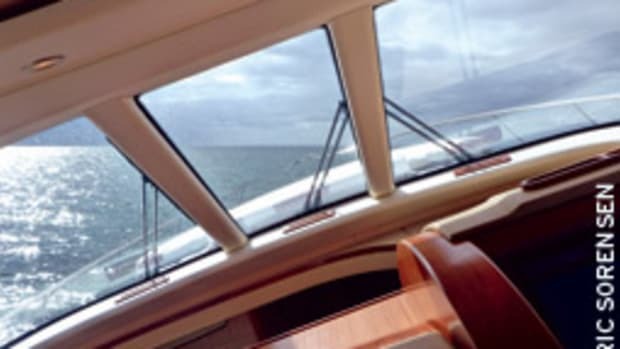 For instance, if you backed down and turned the wheel to port, the stern would go to starboard, which makes things a bit mind-bending when backing into a slip. Joystick control eliminated this problem. And waterjet manufacturers have not been resting on past successes. HamiltonJet’s Blue Arrow system includes a control device called MouseBoat — think boat-shaped joystick. Just move the MouseBoat, and the boat moves in that direction. The computer does the thinking, so you don’t have to figure out whether one bucket should be raised or lowered, or how much rudder or throttle to use. With twin waterjets, MouseBoat gives the boat triple-axis movement: forward/back, sideways and rotation. With a single installation, you get forward/back and rotational movement. UltraJet achieves much the same results with its JetMaster Joystick system, which can be integrated with a bow thruster. It also has a remote tether control so you can walk around while driving the boat, and the system interfaces with an autopilot. Life is good! One thing seems certain — enhanced maneuvering systems will continue to increase in popularity. That’s because owning a boat should be high fun and low stress, and operating it should be easy. People have plenty of reasons to sell the boat and buy an RV or a set of golf clubs, so I’m glad to see some nifty enticements that are bound to encourage many to stay in the game. Today, there’s something for everyone in the boat-handling department. Whichever propulsion flavor you favor, despite my earlier grandstanding, joysticks make life on the water a lot easier and more enjoyable. 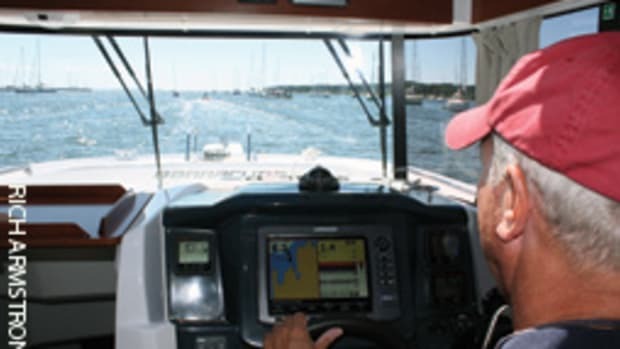 For many boaters, especially those new to boating, the pucker factor should go way down and the pleasure quotient way up with a joystick control system.